First words are everywhere you look, especially in a house! 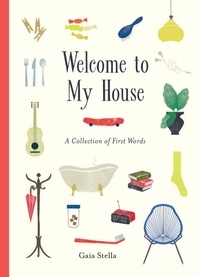 This visually striking picture book catalogs an impressive array of household items, naming the delightful miscellany that comprises a life. The charming collections are creative and unexpected, providing the sweetest of visual snapshots that reinforce word recognition and understanding. In addition to the everyday kitchen, living room, and garden items, there are surprising and smart illustrated spreads featuring "everything for resting," "everything for warming up," and "everything that gets lost." Plus, a seek-and-find element (a hiding cat!) offers bonus amusement. Children will savor the delicate illustrations of things they are learning to recognize, things they are discovering every day, and things they will cherish and use as they grow.